This group is a little different from our others, in that they were formed with the purpose of solving one particular issue rather than a general desire for cleaner beaches. Every member of Pooo Pin is a dog-owner, and their four-legged friends form an integral part of the group’s work. Pooo Pin, which stands for ‘Poo Out, People In’, have run a long-term campaign over four years to reduce the amount of dog fouling at Hive beach. 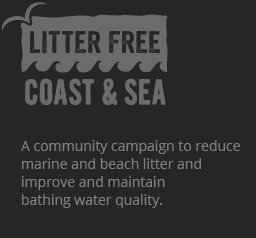 This campaign has been supported by the National Trust, who manage Hive beach and have rangers on site. 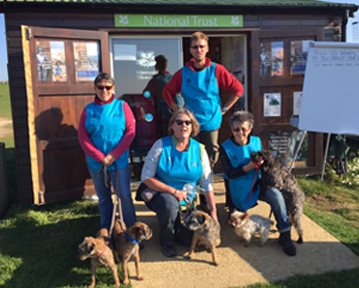 The Pooo Pin volunteers routinely walk the beach in their distinctive blue tabards, chatting to other dog owners and spraying any poo they find with brightly coloured, animal-safe paint, provided by local vet Barry O’Mahoney of Bredy Vets. They leave the sprayed poo for a few days, before returning to pick up everything they’ve previously sprayed, and spray any newly left dog waste. This has made the issue very visible and, combined with informative posters, helped local and visiting dog owners realise the importance of picking up after their dogs in rural areas like Hive. In their first week, the group collected an unbelievable 13kg of dog waste from the beach (yes, they weighed it!). In Summer and Autumn 2016, the group reported they regularly found the beach completely clean, and have broadened their work to the approach paths. They are also mentoring other groups both locally here in Dorset and through our sister project Litter Free Coast and Sea Somerset. In October 2016, Pooo Pin’s work was recognised at the Dorset Volunteering Awards, where they received an award for ‘volunteer group of the year’. Despite their success, Pooo Pin are wary of complacency and are well aware that if they stop work, the problem may well return. In any case, it’s a great excuse for this group of friends and their dogs to meet up on a Friday morning!